I hope everyone had a peaceful Memorial Day yesterday. Here in Houston, it was OK first thing in the morning, but as the afternoon wore on, the clouds started coming through and eventually we got some serious rain. It’s great, we needed it, only the timing was off. It rained pretty heavy this morning, too, although it receded when I went out to bring my sewing machine to Hancock Fabrics. Oh, I broke it last week. I took it to Hancock Fabrics for repair; there’s a gentleman who picks them up every Tuesday and repairs them, then returns them a week later. I did NOT intend for that to happen, but it did. Oh, well. At least the HeatCageKitchen garden is happy with the rain. Yesterday I had my first mojito. That’s a Cuban cocktail with lime and mint and rum. . .and sugar. I used Suzanne Somers’ recipe from her Cocktails book, and sweetened it with SomerSweet. I could only get key limes yesterday at Food Town, but that’s OK. The recipe calls for vodka or light rum; I had vodka left from making vanilla extract, so that’s what I used, along with mint from the garden. Don’t worry, this isn’t a regular thing–I just felt like having a good cocktail, and this mojito doesn’t have any sugar. 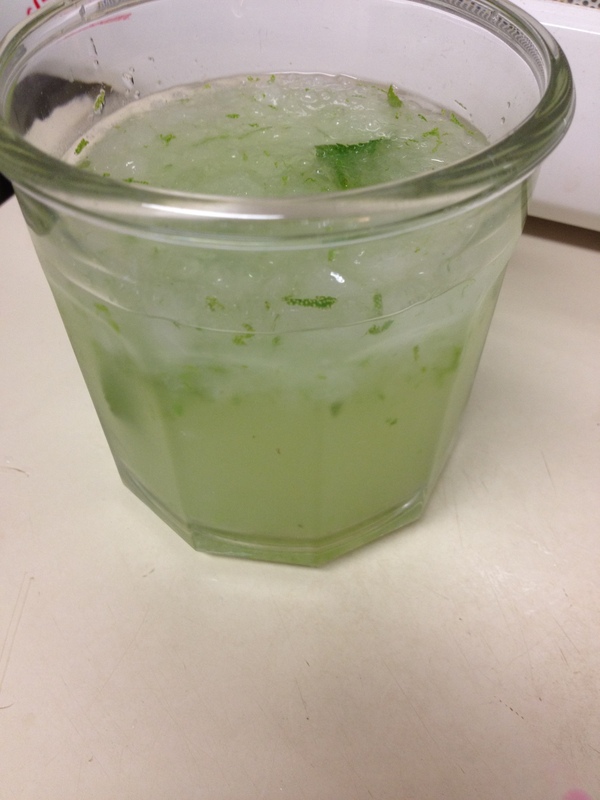 After binge-watching 7 seasons of Burn Notice out of order, I figured a mojito would be great to try. Delicious! But more on that later. In my kitchen, not in Carlito’s. Two things I managed to complete this weekend were carpet cleaning and tidying up the pantry. The pantry in this place is a floor-to-ceiling corner cabinet with three doors and five shelves that is deep enough that you could get lost in it. 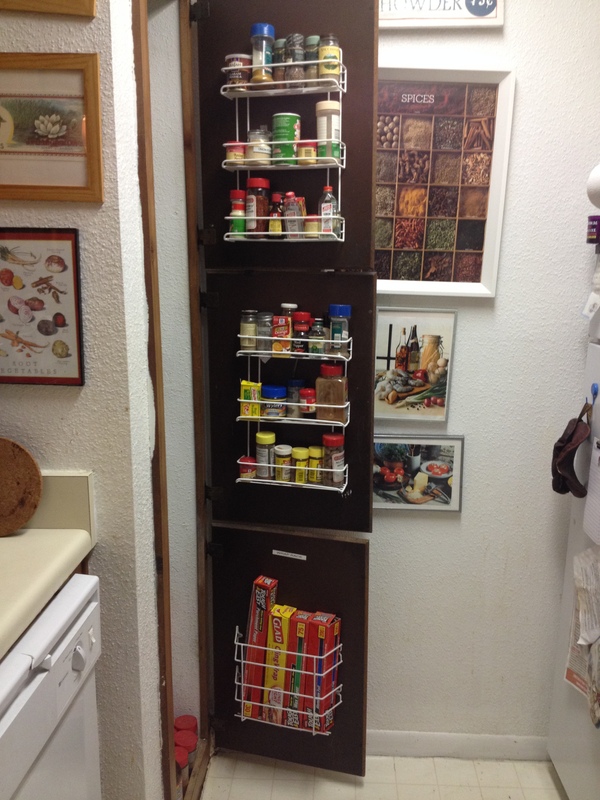 The pantry measures 8′ high, 22″ wide and 21′ deep, with some wasted space above the top shelf. More on that extra space later. It took a while to get this bad. That’s the extra stuff that ended up being jumbled in there. 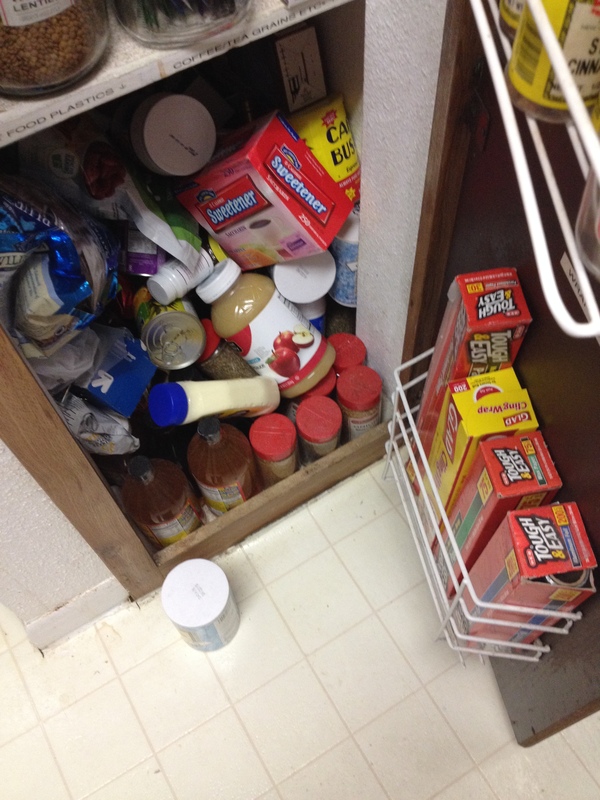 I actually couldn’t close the pantry doors. That’s great, because I have plenty of supplies. I couldn’t close the door. 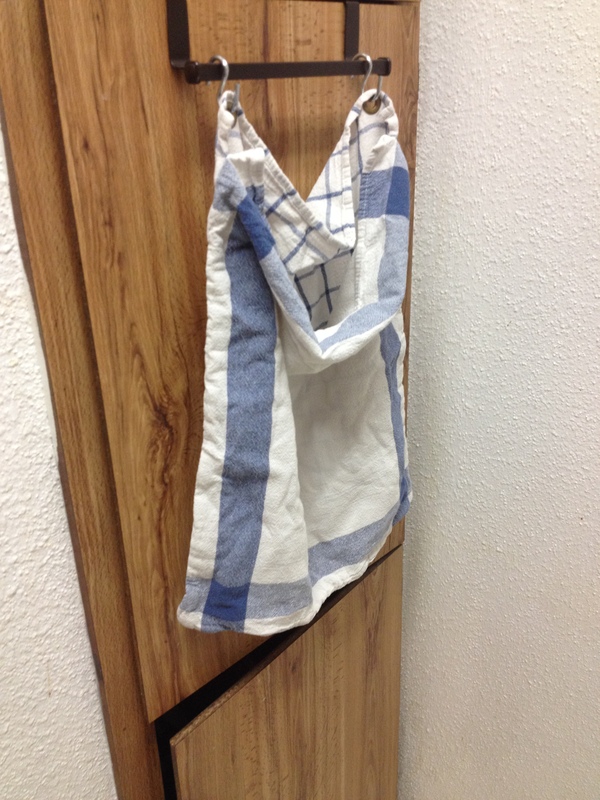 That’s a kitchen laundry bag. 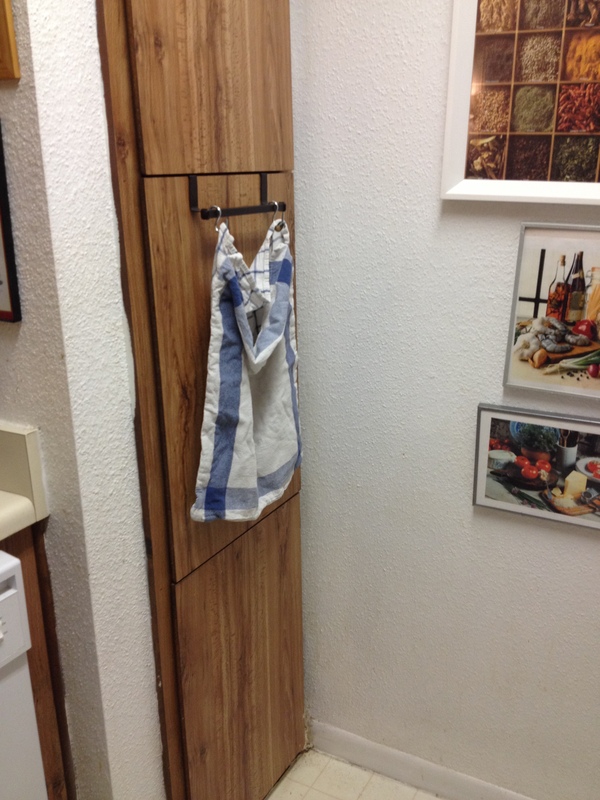 I added these door racks when I moved into this place, and they too are full of spices and wraps. Can you tell I love my Brother P-Touch label maker? 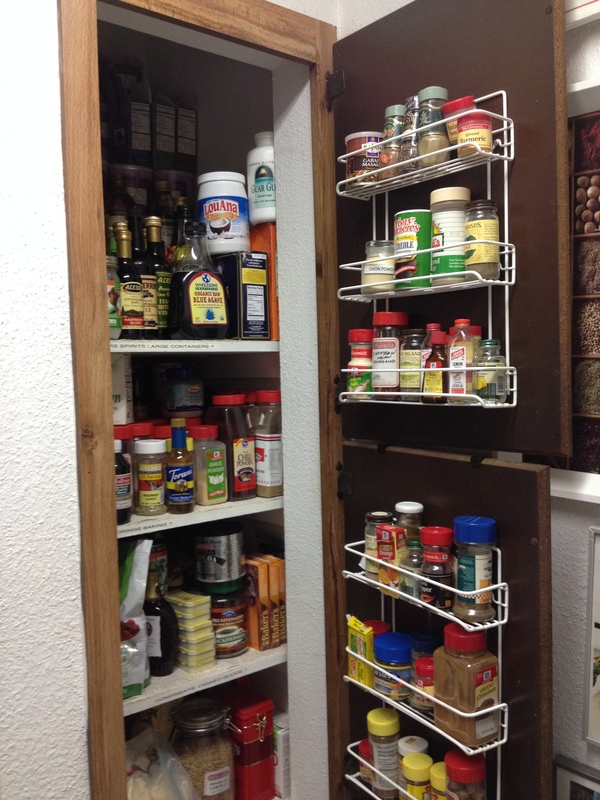 I do this pantry re-org every so often, when I really have to, and it’s usually an all-or-nothing thing. 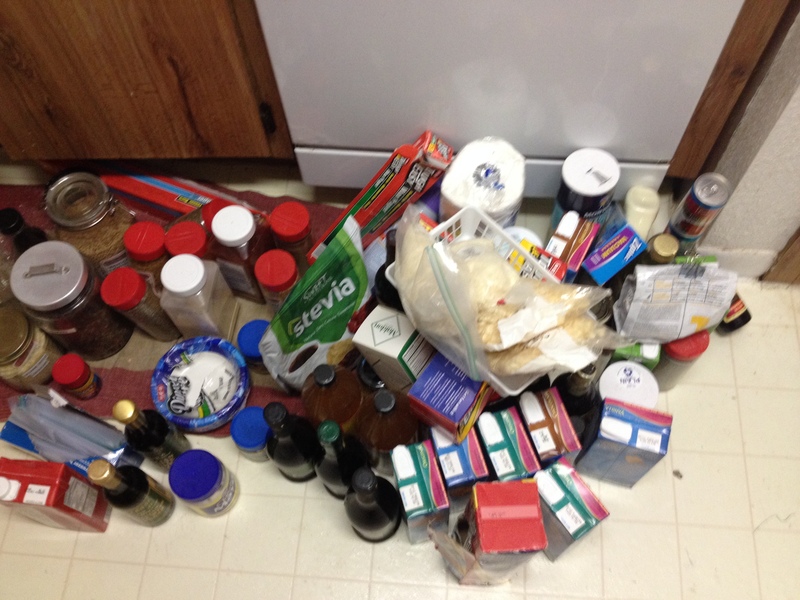 I take everything out of the pantry, wipe down the shelves, clean up any spills, and put it all back. I’m low on baking soda, almond milk, kosher salt and nearly out of quinoa. I’ll live without the quinoa, of course, and I’ll get more soon. Normally I have a large jar full of quinoa, but I’ve been using it and not replacing it. Now I’m nearly out. 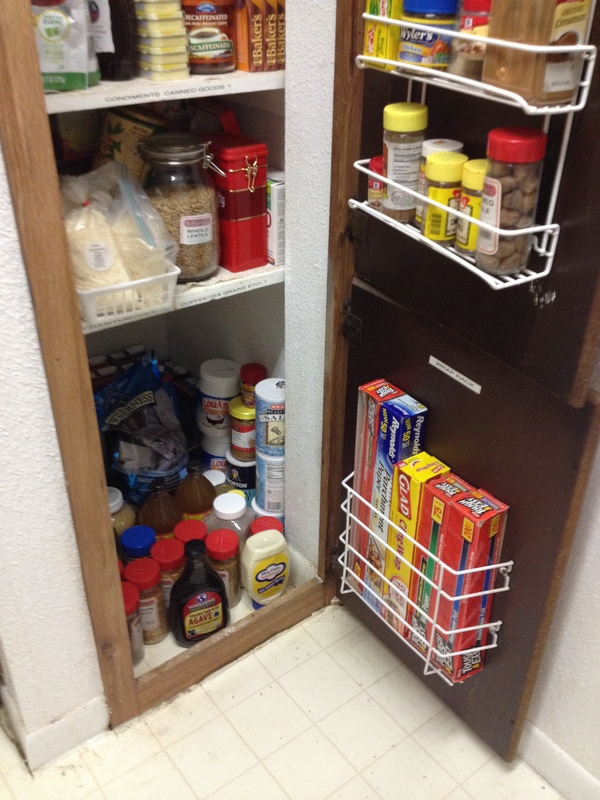 See why your pantry needs to be tidy? Now, longtime readers of this blog may remember my column last year on the old Suda Salvage store in River Ridge, Louisiana. 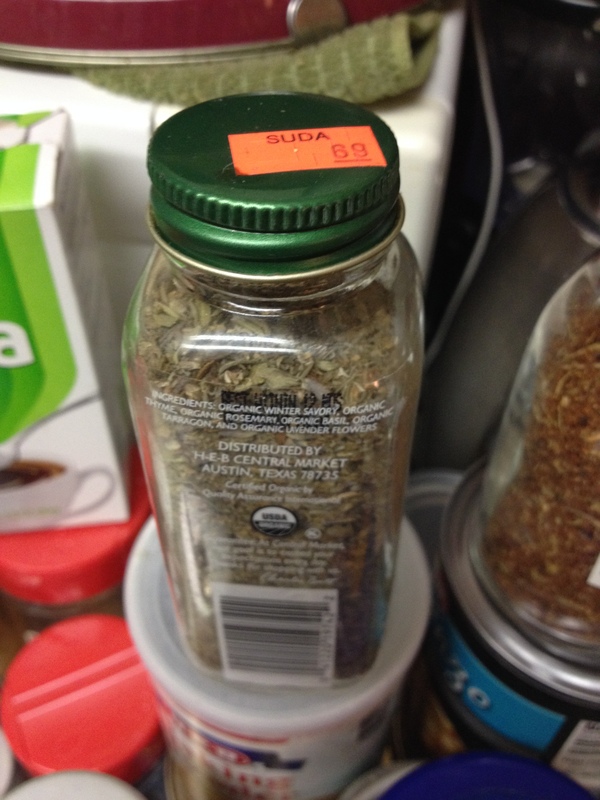 I bought this bottle of Central Market herb mix on one of my last trips to Suda.. If you’ve never been in Central Market, you won’t know that this bottle sells for about $7 or $8 in HEB and Central Market. The contents of this unopened bottle and another small, partial bottle went into a larger bottle of Herbes de Provence from Phoenicia. Saved a little space, and really, I don’t think it’s going to make that much of a difference. Dried herbs are pretty good for a long time anyway. Now, because the pantry is as deep as it is wide, stuff gets stuffed way back in there, and you don’t realize you’ve got a jar of curry paste and three unopened jars of French chestnut creme bought on sale at Williams-Sonoma right after Christmas after Nigella Christmas came out. It took pretty much all afternoon. 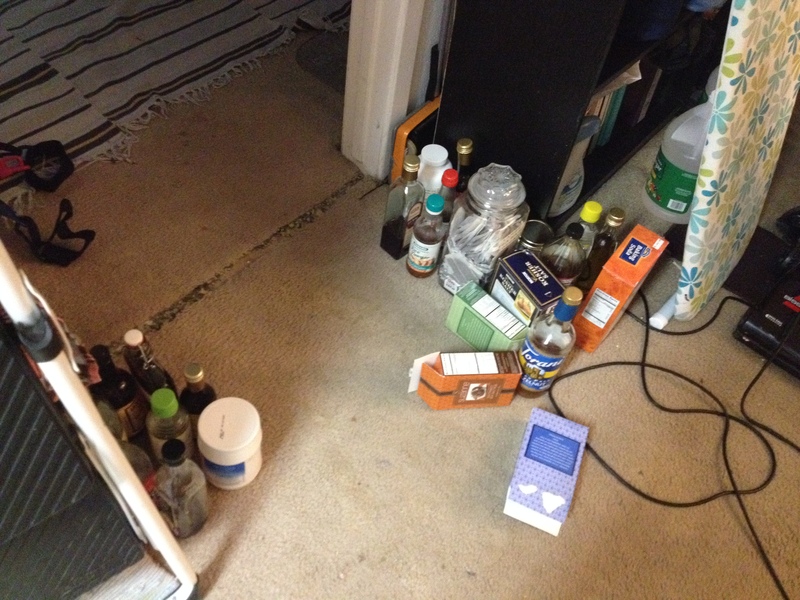 Between consolidating, tossing stuff I don’t need anymore, and figuring out what goes where, it took about six hours. No kidding. I was too tired to clean carpets when I was done, that’s why I was doing it Monday. Did I mention two broken sewing machines? Anyway. . . . I did manage to make more of my favorite sugar-free Barbecue Rub I told you about last week, using up the thyme in the fridge. (The thyme was in one of those cups like the ones you get cold coffee drinks with whipped cream in at Starbucks, with the hole in the top.) I also have two very large containers of chili powder, after running out one day and not realizing I’d already bought some. Time to start making more chili. 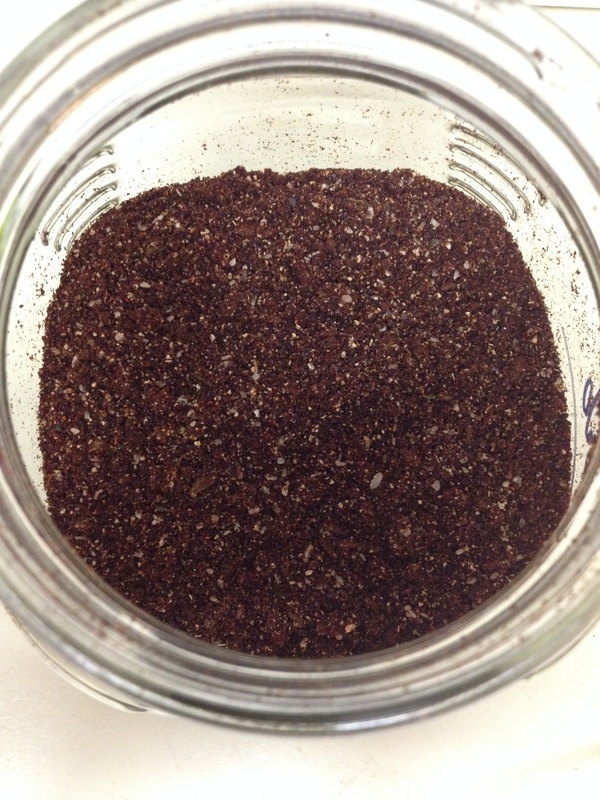 The easy-to-make barbecue rub. No sugar or toxic additives. How hard is it to miss this? The canister holds a nearly-full bag of . . .decaf coffee. 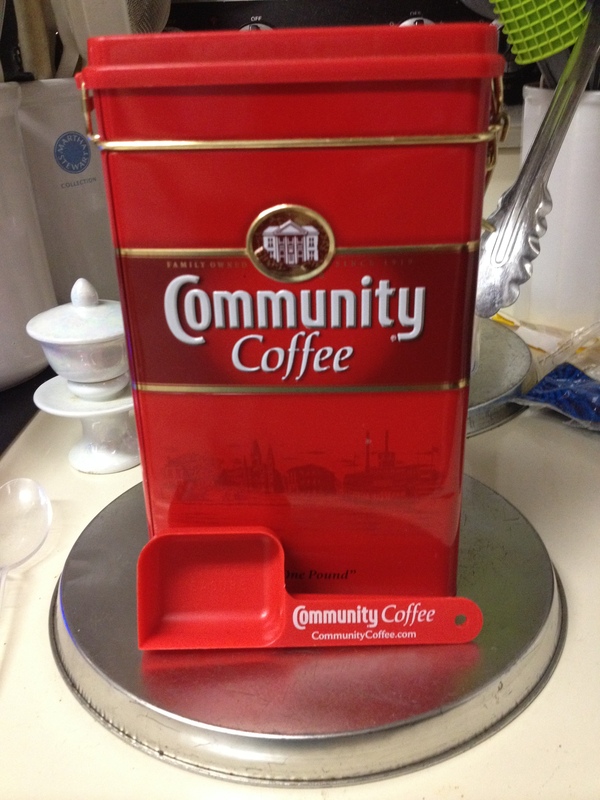 I got the canister several years ago when they were selling them at HEB with a pound of regular Community Coffee shrink-wrapped to the front. I gave the coffee to someone else, just so I could have the canister. You can’t buy it on their website right now by itself, but it is available as part of a set. Maybe one day I’ll write a blog post about my coffee cups, coffee and stuff, and the French press pots I use. I’ll give that some thought. I’ve got a lot of coffee in the back of that pantry, along with the tea. Need to start drinking it again. I did make some iced coffee, but going up and down the stepladder had a lot to do with that. Another thing I discovered a surplus of is. . .SomerSweet. I’d bought a case of 12 during a sale, and another case of 12 during another sale, and had some already, but didn’t realize it. 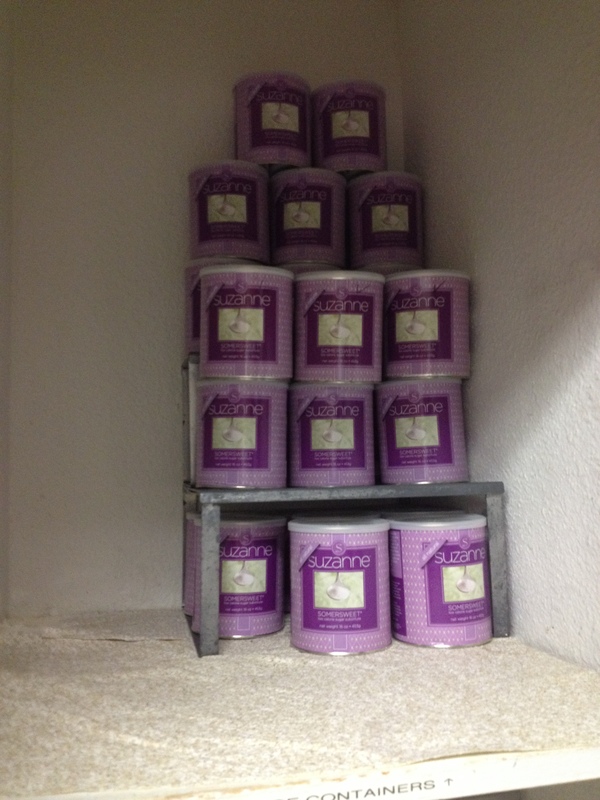 Once I’d pulled everything out, I sorted these cans by expiration date. Now, it’s a dry powder, and it’s in a sealed can, so a sell-by date doesn’t mean it’s necessarily bad. But there are three cans that I will use first, (the ones with check marks on them) and the rest in time. That’s a total of 25 cans of delicious, natural SomerSweet, not counting the open can in the fridge. Time to start making some sugar-free delights!! I happily made myself a delicious sugar-free mojito last night using SomerSweet. Took a little more SomerSweet than the recipe required, but that book was written when the cans were very small. Now SomerSweet is cup-for-cup with sugar, so you multiply the old amount by 5 or use the sugar equivalent. I’ll be doing that again one day. Maybe soon. Now, you’ll notice that there is a lot more space above the SomerSweet, wasted space. Last time I had wasted space like that I put in some wire shelving that held extra stuff and emergency supplies. I have considered adding it here, but I’m not ready to do that just yet. The “spare” area at the bottom is also tidied up. But the little cans of cat food are still on the stove. Maybe I’ll find space another time. 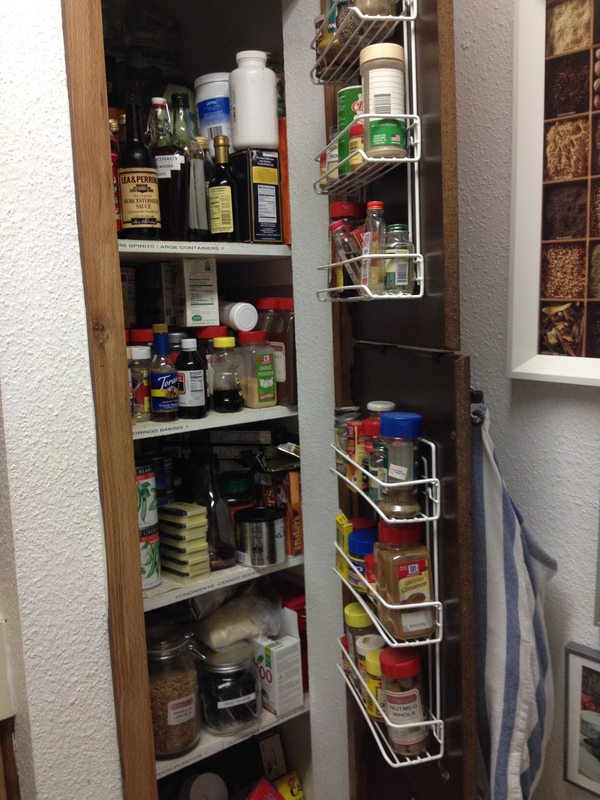 And look–now I can close all three of the pantry doors! No more open door and stuff spilling onto the floor every time I need something. Seriously, I should have done that a long time ago. 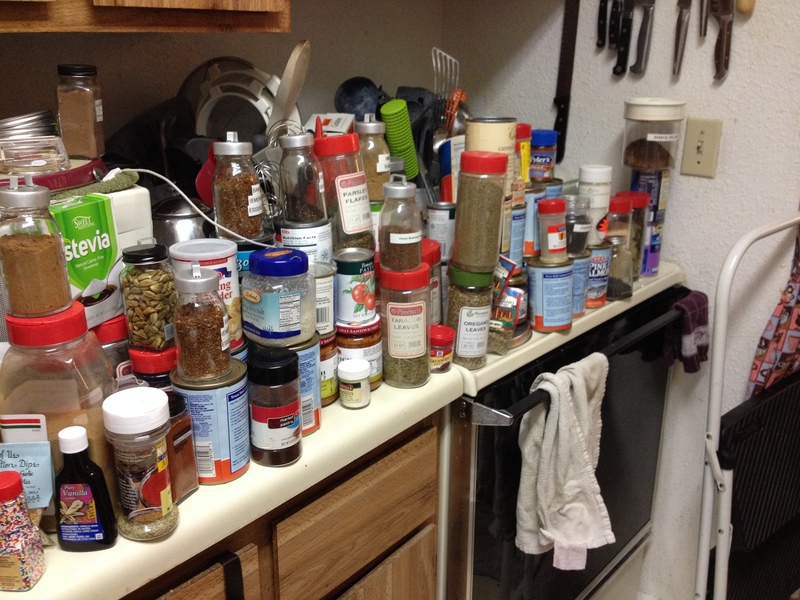 Like a lot of things, I put off dealing with the pantry. I am also a big believer in dumping my purse occasionally and tidying that up, too. Because I’ve been interviewing, I have a nice purse I bought in December just for interviewing, and I’m also using a cloth purse I made just for short trips like the library or the grocery, so I’m aware of everything in my purse. But over time, stuff accumulates, gets heavy and gets lost. Dump your purse regularly, and you’ll be able to lighten the load a bit, and keep from losing things, too. Men, you are not off the hook–tidy up your wallet now and again, and make sure there aren’t any “ex” pictures in your wallet, OK? And you don’t want to sit on a big lump of whatever’s in there, right? I’ll get my sewing machine back next week, I hope, and I’ll be happily stitching again. Yes, I know that there is a grocery store by the name of Pantry Pride. There used to be a huge chain, but they’re gone now, and the only one is in St. Mary’s, Ohio. I looked it up, and figured it was safe to use it for a title. Meantime, have a great week, and Happy Dining!